The St Giles Mbira Band will perform in the USA at the World Children’s Festival from June 30 to July 3, funds permitting. 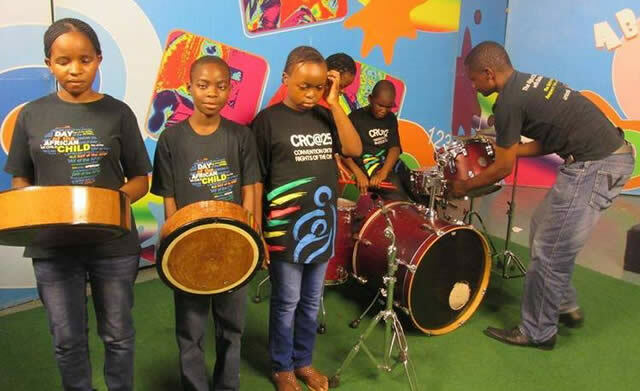 The travelling band has five visually impaired children who play mbira, drums, hosho, bongos and other percussion instruments. Versatile young drummer Tanyaradzwa Gondo wows fans every time he performs. The Herald Entertainment spoke to the Special Schools Arts Festival co-ordinator, Ticha Muzavazi, who leads band. “St Giles Mbira Band has been invited to be part of the World Children’s Festival from 30 June to 3 July in Washington DC. The festival is the world’s premier children’s celebration of creativity. The fifth edition of the festival opens this June 30th at The Ellipse, President’s Park,” he said. He also said the World Children’s Festival will open many doors for the St Giles Mbira Band. “Although we have had Prudence Mabhena and Liana travelling to America for the 2010 Oscar Awards, the fact remains that such opportunities are rare for children with disabilities in our families, homes and schools. “Therefore, this participation in the World Children’s Arts Festival is an opportunity to increase focus on disability issues in our country with an impact that goes beyond stage performances,” he said. Ticha Muzavazi said there will be three days of educational workshops and stellar performances from children all over the world. “Three days of educational workshops and electrifying performances by children from about 35 US states and 70 countries will take place on June 30 and July 1, 2015 from 10:00am until 6:00pm and on July 2, 2015 from 10:00am until 4:00pm. Our children will be among the groups and, an award ceremony will be held for outstanding participants on the 3rd of July,” he said. Muzavazi said the whole group has a lot to learn from this expedition and would like the public to help them raise funds for this USA show. “Their award initiative is also one of the aspects we have been considering, but there are dynamics one can incidentally learn by such involvement. “The children have since contributed $100 towards some registration or confirmation of their participation. We are already through with application for passports which should be availed by the end of this week. We are still looking for a total of $14 094 and appeal to the public to help us raise this amount,” he said. Children at St Giles Special School have been in mbira music since 2007. They have since grown into a band with Western drums, bongos, djembes and other percussion instruments. The children have taken part in arts festivals like “Vana Venyu”, BUDDYS, High Schools Arts Festival, Schools Mbira Festival, Pakare Paye Solo Festival and the Harare International Festival of the Arts (HIFA). They participated in anniversaries and commemorations of the Women’s Day, Day of the African Child, National Disability Expo, International Day of Children Broadcasting and the International Day of Persons with Disabilities. They perform in musical concerts organised by institutions like the University of Zimbabwe and the Zimbabwe College of Music and participated as competitors in Eisteddfods Vocal and Instrumental Festival. The children in St Giles’ current musical outfit were greatly inspired by their pioneers who recorded a musical album in 2010, performed with musicians like Dereck Mpofu and opened shows for Victor Kunonga and the late Chiwoniso Maraire.